"Where Should I Start My Austin Home Search?" "Where Should I Look For An Apartment in Austin Texas?" If you are trying to find the best place to make your home in Austin Texas, this page is intended to help you. Here you will find vital information about each of the geographical areas of the city. Regardless of whether you're planning to buy or rent, you need to choose where in Austin to live. There are many factors to consider when choosing a neighborhood. Location, traffic, home prices, property taxes, rents, crime, and school districts are all things you might have to think about. This page is designed to help you with your Austin home search or find the perfect apartment in Austin Texas. Austin comprises many neighborhoods, each with its own individual character and appeal. Some people like to live downtown, close to all the action. Others prefer the relative quiet of the suburbs. Before you begin your Austin home search or look for an apartment in Austin Texas, you first need to know the lay of the land. Then, you can focus in on one or more neighborhoods and work from there. Labeled in black are the main geographical areas of the city. The colored lines running north and south and east and west are major landmarks dividing one area from another. 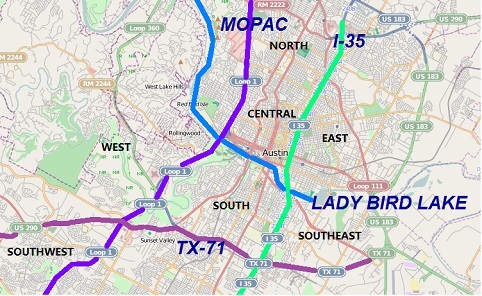 For example, Lady Bird Lake separates Central Austin from South Austin, and I-35 divides Central and East Austin. Knowing something about the different areas can help you narrow your Austin home search or pick the right apartment in Austin Texas. Below is a brief description of each area. Among the most desirable areas of town, because of the location near the beautiful Texas hills and the top-rated school district. You just might run into one of the celebrities whose Austin home search led them here, like Dennis Quaid or Sandra Bullock. Home prices start at $500,000 and run to $10 million and up. A large area encompassing a range of geographical locations and home types. Favored by families because of the peaceful location and proximity to downtown. Home prices range from the low $200s up to $1.5 million. One of the fastest growing areas of town, and in the midst of a revitalization. Also the quirkiest area of town; it embodies the idea of keeping Austin weird. You'll find older homes ranging from $250,000 to $450,000. Gaining in popularity as more young singles move to Austin seeking to be in walking distance of downtown. Most well-known for deluxe $1 million condos, but you'll also find a wide range of homes. Prices from $200,000 to $2.5 million. Another desirable area because of the proximity to downtown, to major employers, and to high-end shopping. New shopping centers have just been opened here, and, further north, there is a high-end outlet mall. IBM and the University of Texas Pickle Research Campus are located here. Home prices from $130,000 to $1 million. East Austin has long been an area of historical sites and landmarks, fine local restaurants, and affordable housing. But a construction boom is changing the character of East Austin by adding new planned communities. Homes are available from $150,000 and newer homes go up to $1 million. A large area that includes affordable college residences near the city and country estates farther out. Close proximity to the airport, and also parks, golf courses, and bike trails. In some parts, high crime rates and older starter homes keep prices low. You can find some houses under $20,000 here and others up to $800,000. NEXT: Visit the Austin Neighborhoods page for more detail about each of the regions and some of the neighborhoods in each.